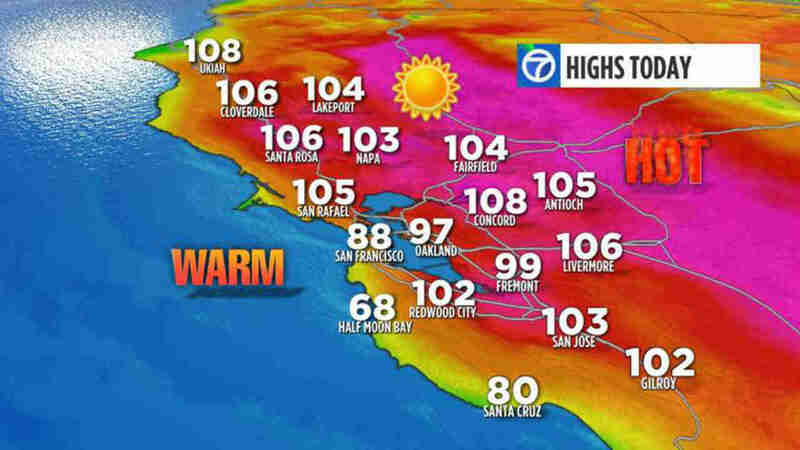 SAN FRANCISCO (KGO) -- It was the hottest day of the year for many Bay Area residents Sunday. In fact, 10 cities set new records: San Rafael, Moffett Field, Livermore, Kentfield, Richmond, San Francisco, SFO Airport, Oakland Airport, San Jose and Gilroy. A Heat Advisory is in effect for much of the region and will last through Thursday night. Some tips for beating the heat: take frequent breaks in the shade or in air conditioning, drink lots of water, wear light weight clothing and check on seniors and pets as they are the most susceptible to the heat.